SKICKS™ are officially licensed canvas sneakers, specifically designed to show your collegiate spirit! 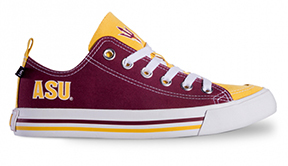 Whether you are hiking “A” Mountain, cheering on the team at Sun Devil Stadium or representing ASU in your city, these sneakers are the perfect way to showcase your Sun Devil pride. ASU alumni get 15% off SKICKS sneakers with promo code ASUAA!